A few weeks ago we had school registration. My youngest asked if we could go to breakfast after his registration. “Great idea!” I replied. This year our school started something new; you could pre-fill out most of the paperwork and drop it off ahead of time. I told my son that if I did this, and we got to school right when registration opened, we could zip through the lines and have time for a quick breakfast before I had to get to a meeting at work. I had good intentions, that didn’t leave room for digression. Such as the fact that while at school, we learned that his schedule was messed up. Instead of having him in Computer Science, he was registered for Cooking. Close enough?! I guess they both start with “Co.” So, this meant we had to go to the registar. And then to the counselor. And then back to the front office. Needless to say, when we were finished, we didn’t have time for breakfast. Instead I gave my credit card to my daughter and she took her younger brother to breakfast, and I went to work. This should’ve been the end of it. I was glad they got to spend one on one time together. But for the rest of the day I had this terrible mom guilt. Registration is only once a year; I told him we’d go to breakfast; soon enough he won’t ask me to go to breakfast. I have this terrible mom guilt with an added layer of Catholic guilt for good measure. I know I shouldn’t feel this way, yet many of us do. So I’m hoping that by thinking it through logically, and offering some ways to handle it, I can work through my own mom guilt and give you some useful tips to assuage your mom (or dad) guilt if needed! Be empathetic to yourself. I am a very empathetic person – to everyone but myself. I need to start practicing acceptance and understanding of me. Change your way of thinking. Turn your negative feelings of guilt into something positive. Feel guilty because you work? What about the example you are setting for a strong work ethic? Or the financial freedom it brings? Instead of feeling guilty that I missed a promised breakfast, I should’ve appreciated more the time my son got to spend with his big sister. Forgive yourself/ask for forgiveness. A feeling of guilt implies a wrongdoing. If you truly don’t like the choice you made that led to the guilt, ask for forgiveness and move on. Do better next time. Nobody is perfect – remind yourself of this! We all experience mom guilt to varying degrees. If it’s truly an impediment to your happiness, please talk to someone. 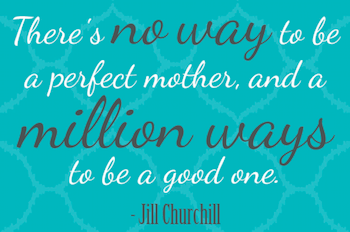 Otherwise take a deep breath, learn from it, and carry on being the amazing mom that you are.